In this tutorial you will see how you can use a free audio application, Audacity, to change the tempo or pitch of MP3 backing tracks or songs. * Changing tempo helps when a piece is too fast for you. You can slow its tempo until it's comfortable, then gradually speed it up as you improve until you reach full speed. * Changing pitch is useful when you want to play in a different key than a recording. You might want to use easier chords, avoid retuning, or maybe you want to practice something in all twelve keys. If either of these sound like the kind of things you might want to do with your jam tracks or recordings then read on to find out how. Changing the tempo or pitch of MP3 files with Audacity is quite simple, here are the steps we'll look at in this article. 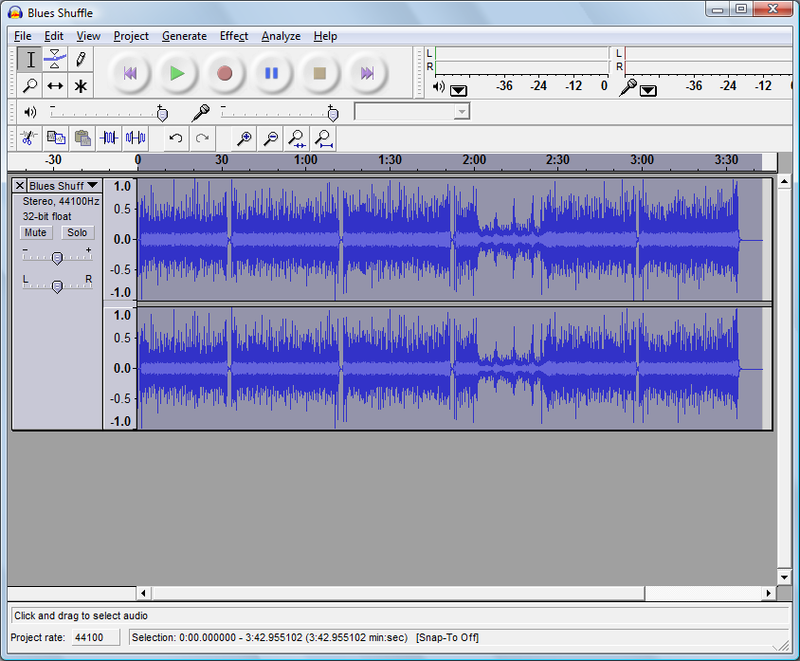 Once you've launched Audacity you can open an MP3 file by clicking the File menu and selecting Open. Browse to your MP3 file in the dialogue that opens. If your backing track or song is on a CD then you can convert the CD track to an MP3 first. To do this select Import Audio... from the Project menu, import your CD track and then select Export As MP3... from the File menu to save it. 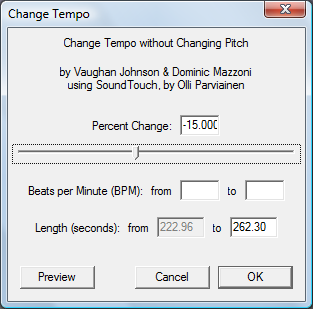 Once you've opened your MP3 file you must select all the audio data so you can apply tempo or pitch change effects to it. The simplest way to achieve this is to hold down the Ctrl key and press the 'A' key (you can also do it via the Edit, Select... menu). Important: Effects are applied to the selected audio, so you must ensure all the audio is selected whenever you apply an effect. Done that? Good, now you can modify the tempo or pitch of the track to your heart's content. Let's start by looking at how to modify the tempo. Pitfall: Don't select "Change Speed..." from the menu, that effect modifies the pitch along with the speed. A dialogue like the one shown below appears offering controls to change the tempo by a percentage, beats per minute or by altering the length of the track. I mostly use the percentage change to slow a track down a certain amount. To slow things down drag the slider to the left so that a negative value appears in the Percentage Change box, like the figure below. It's a good idea to create several files at different tempos at this stage. For example, you might save files at 30%, 25%, 20%, 15%, 10%, 5% slower than the original. As you practice and improve you can move from file to file until you reach full speed. Important: Each time you use the effect it is applied to the result of the previous application. Slowing down in two steps of 10% each doesn't give the same result as a single 20% slowdown to the original. I always start from the original file, apply the tempo change I want to it, then save the result in a new file. To create a file with a different slowed tempo I start from the original track again so that tempos are all relative to the same point of reference. 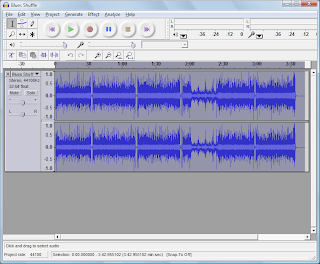 We'll see how to save the slowed-down audio in a minute, after we've seen how to change pitch. To modify the pitch of a track select the menu Effect then click Change Pitch... A dialogue like the one below appears. You can use any of the proposed methods to change pitch. I mostly use the Semitones value to shift pitch up or down a number of semitones. 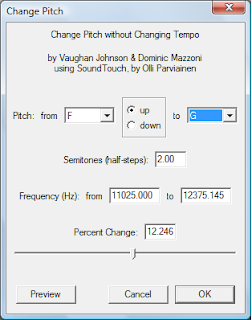 If you use the Pitch control be sure to select the correct starting pitch, Audacity doesn't figure this out for you. Now you can modify the tempo and/or pitch of your audio tracks any way you want. You can save the resulting audio to new MP3 files so they are ready to use in your practice sessions. Saving a new MP3 file is easy, simply open the File menu and click Export As MP3... Then you can give your new track a name and save it to your media library. Note that the original MP3 file remains intact, unaltered by the process described here. Let's take a quick review of the process to modify tempo and pitch and create new MP3 backing tracks to play along with as you practice guitar. Save the result in a new file and you're ready to jam. Backing tracks are a fun guitar practice tool and they also help you learn to play in time with a band. With the simple process described in this tutorial and the free Audacity audio software you can easily tweak backing tracks to suit your current playing level and needs. Nice tutorial. I haven't used audacaty too much. When I did record I used cakewalk's sonar. I'll have to check out audacity since it's free.